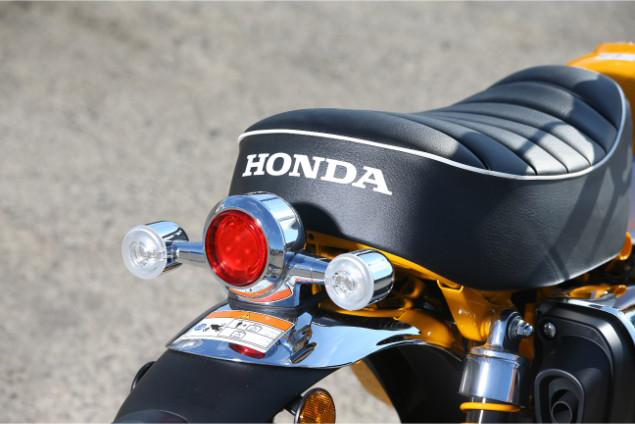 It may not be as small and as cute as the original and iconic Honda Monkey bike. But the new 2018 Honda Monkey 125 does a fantastic job of bringing the Monkey up to date, while still retaining that iconic design and attitude of the original. The new Monkey 125 has just gone on sale in the UK, and we grabbed a quick ride on the bike on the streets of London earlier this week. 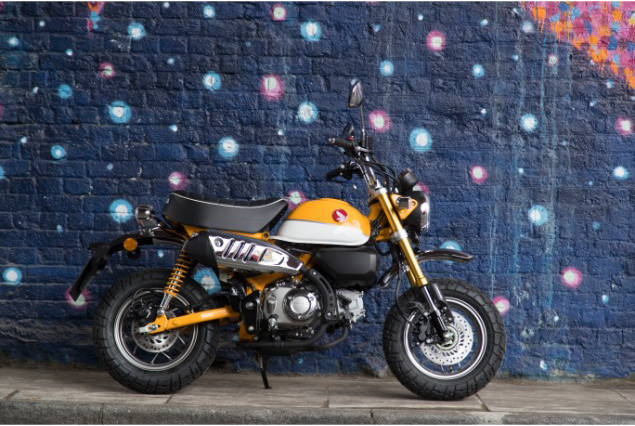 Using a retuned 125cc air-cooled engine from the MSX125, or Grom as it’s known in other parts of the world, the new Monkey makes 6.9kw (9.25bhp) and uses a new steel backbone frame and new styling with some high-end features for a bike that costs just £3699. It’s A1 licence friendly for learners, too. 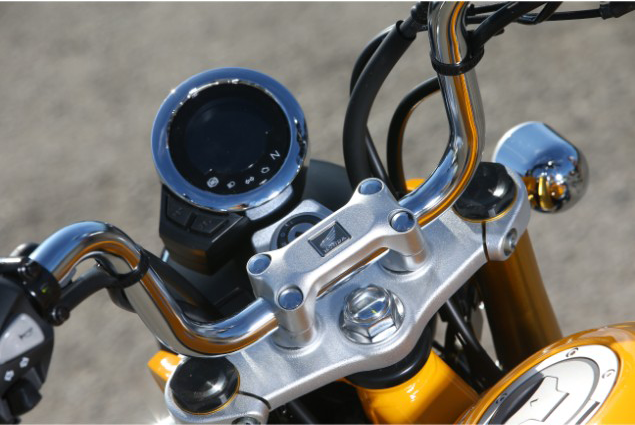 LED lights front and rear, LED indicators, upside down forks and a leatherette, stitched and piped seat add to the modern feel, while hinting back to the original Monkey bike. The Monkey is by no means large, but parked next to the original 1961 Monkey bike, it’s amazing just how physically bigger it is. More three quarter-size than pocket size. But it works on the road. Nobody is ever going to buy a Monkey for practical reasons, but the new Monkey 125 cuts its way through town as well as any 125cc motorcycle. The upright riding position means that passing Taxis and buses doesn’t scare you as much as riding an original one as you’re that bit higher, and less vulnerable. The suspension is bouncy at best, the twin shocks hardly damping out speed bumps, but again nobody ever bought a Monkey for its handling. The chunky tyres are grippy enough, the brakes work, and it will pull its way to 60mph through its 4-speed gearbox. First gear is short, second gear is longer. It just gets on and does the job, even if the motor makes marginally less power (9.65bhp vs 9.25bhp) in its Monkey guise than the MSX125 it’s based on. It’s incredibly frugal too, making a claimed 189mpg. Yes, you read that correctly. One hundred and eighty-nine miles per gallon. It may not quite achieve that from its 5.5 litre fuel tank, but after 60 miles we barely saw the fuel gauge move. But more than the way the Monkey bike rides is the way it looks. If you’ve ever fancied a Monkey bike this truly is a great recreation but with modern touches like Inertia Measurement Unit-based anti-lock brakes, an electric start and LCD clocks. Most people who buy these aren’t actually going to care how it rides. 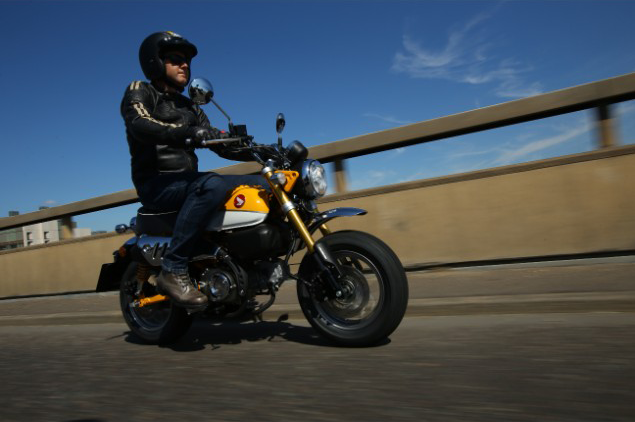 It’s a Monkey bike, it rides well, and it evokes that fun, free and easy spirit of motorcycling that has rarely been achieved in recent years except maybe by Ducati with its Scrambler. The Monkey is back, and we want one. The original Monkey bike was launched in 1961 and designed for use in a Japanese amusement park in Tokyo. It had 5-inch wheels and foldable handlebars which meant it could be fitted in a car boot. The bike made 3.1Kw from its 49cc engine. 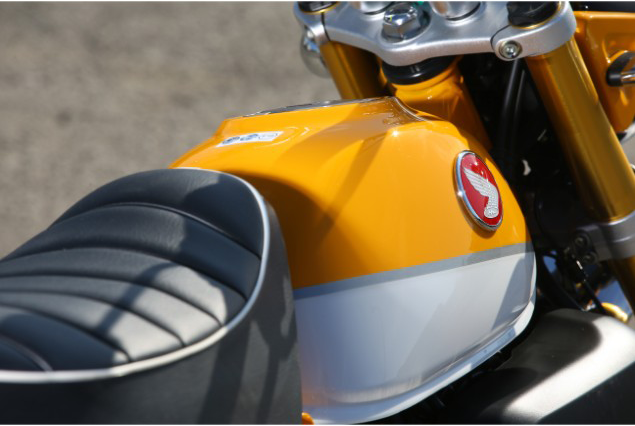 A road going version was launched in America and Europe in 1963 with a chrome petrol tank, chunky tyres, a three-speed gearbox using a centrifugal clutch, no clutch lever, and a cute, instantly loveable design, and the Monkey legend was born. 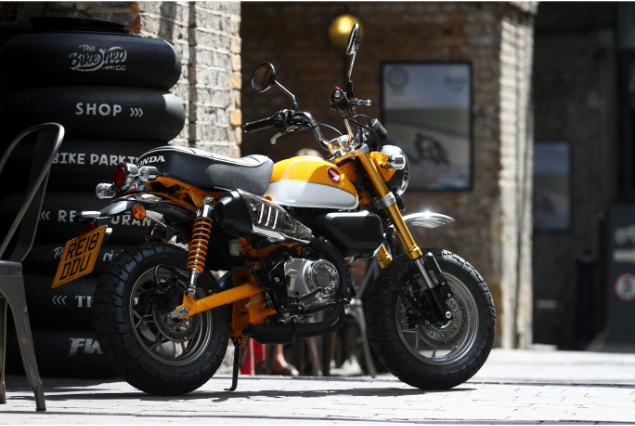 Dozens of of Monkey bike special editions have been launched, from the original to special editions with gold petrol tanks, a mini Africa Twin replica with Baja headlights, and even a R model with twin spar frame and clip-on sporty handlebars. Monkey bikes from the seventies and eighties now fetch around £2000 in average condition, with some special editions, like the Baja, costing as much as £6000-£7000. At £3699, the new 2018 Honda Monkey bike is designed to be at the lower end of 125s, but really its biggest competitor is Honda’s own MSX125 at £3389. The MSX is faster and handles better, and already has its own cult following. But we’d buy the Monkey 125. Just look at it.